Are you trying to race or pace your way to success? Life-lessons happen when you least expect it. …Even when you’re on holiday! I was blessed to spend a whole week hiking in Grindelwald, Switzerland. 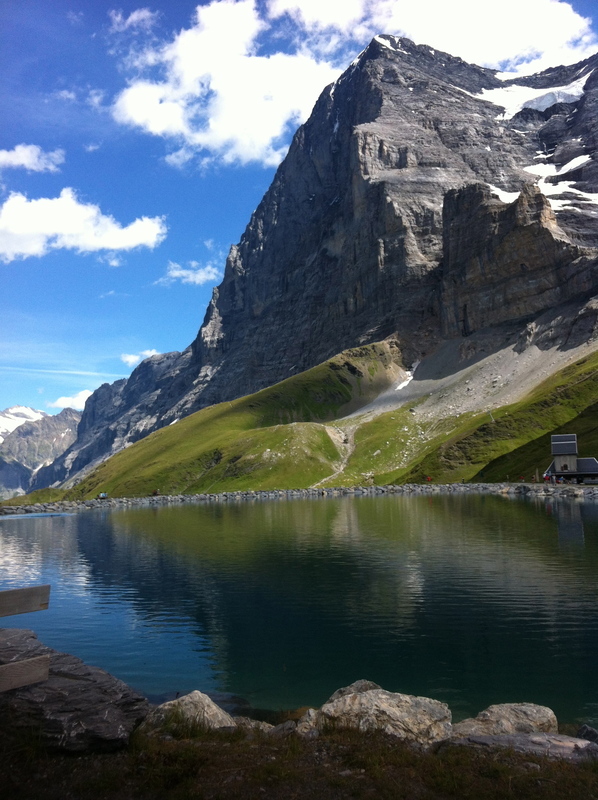 My chalet over-looked a stunning valley that led your eye directly up to the north face of the Eiger. Bernard, our mountain hiking guru, knew a lot about this mountain. He’s is a very experienced hiker in the Alps (Swiss born and bred!). He told us of how climbers had perished here in their quest to conquer the north face. Many had been caught out by the sudden change in weather – some had frozen to death overnight or had slipped and fallen;, others were the victims of rock falls. Then he led us on the Eiger Trail. This was a 10-hour hike beginning with a 3-hour assent up to the base of the Eiger. It was hard work and I learned so much observing how people approached this assent. Some raced ahead to ‘get her done!’ Not knowing the length of the climb they were soon out of breath, feeling tired and the affects of the thinner air. They weren’t prepared. One woman in another group had to turn back because she’d started too quickly, became overwhelmed and panicked. She was both mentally and physically affected by this challenge. It’s easy to get swept up in the enthusiasm and race ahead. In our group, Bernard told us that his wife, Anita was a slow walker but she could walk for miles and miles. I watched and learned from her as we made our assent. She was always at the end of the line, last to arrive BUT she focused on her own pace and enjoyed every step of the way. She was never out of breath or uncomfortable. She set her own pace and refused to be distracted by inwardly comparing herself to others who were pushing ahead and moving faster. She focused on her own goal and worked consistency to achieve it. Then, into the journey, we get exhausted or distracted… perhaps because we haven’t thought things through properly or we’re too busy ‘doing’ to notice that we’ve deviated off the right path? We use all our energy at the beginning and there’s little left to keep us going for the whole journey. In our haste to get to the summit we’re not interested in the ‘tedium’ of doing the work – one foot after the other. We just want the end result NOW! And we race to end as quickly as possible just to get it done. Are you setting yourself up for success and committing for the entire duration of the journey or are you looking for any quick way to get it all done?! 1. Being successful involves discipline and persistence – You have to show up and do the work EVERY single day. Hiking up a mountain involves taking every single step along the way… one after the other. Creating a business or building a career is very similar. You have to be in it for the duration – not just when you feel like it. 2. You can only enjoy it fully if you set the right pace for YOU. Listen to your body and be guided by your own intuition. Stretch and challenge yourself – YES! Kill yourself – NO! Set your pace for success and commit to it. It’s not about racing, it’s about pacing! 3. Don’t get distracted by comparing yourself to others. YOU are YOU… You’re not someone else so stop trying to contort yourself. Be 100% pure YOU! Start from where you are today and do it your way! Be the leader in your life by setting your own pace. It’s NOT a race… It’s just you and the mountain! (it’s just you and your goal). 4. Enjoy the journey. There is much to see (and learn) along the way – take it in… FULLY experience what is happening and what is around you. Many people walk through life unconsciously and become de-sensitized because we’re just ‘too busy’ getting things done. Some hikers were focused on getting to the top and didn’t even stop to take in the breath-taking views and beauty around them. 5. We are all human beings – no one is better than the other… Racing to the top of the mountain (or your end goal) doesn’t make you BIGGER, better or more important than anyone else. You need to take action and do the work – one step at a time. Get there on your terms NOT on your ego’s terms! It’s NOT about racing… it’s about pacing! A brilliant metaphor Elaine. Another thing I would add is that some bits of the journey can be harder than others and then we can slow our pace doen and take more rests but still keep moving forward. The metaphor here is perfect! Plus…the images of Switzerland are always awe-inspiring. Lovely journey. Allison – Thanks! I LOVE what you say – yes it’s so important to slow the pace down at times so you can still keep moving forward. Robinsunne – Thanks for stopping by. Yay! to more play! :-) In our busy-ness we forget to pause and take in the beauty of what we’re doing or what’s around us. Susan – Thanks so much! – Switzerland was beautiful and inspiring. I’m honored that the timing of this article was just right for you.